The exhibition at the Milwaukee Art Museum that runs through May 4 is titled "Uncommon Folk: Traditions in American Art," but it might well have been called "Total Immersion." Nearly 600 paintings, carvings, quilts, furnishings, toys and other objects fill to the brim the 10,000-square-foot galleries of the museum's signature Quadracci Pavilion, designed by Santiago Calatrava. At the entrance, trade signs greet visitors in the form of a late 19th-century carved wooden boy peddling newspapers [below right]; a hurried sheet-metal waiter, tuxedo tails flying behind him; and a gold-painted pair of spectacles, the once-common sign for opticians. Around the corner, there's an elaborate, 71/2-foot-long red, white and blue whirligig of sporting figures, from the 1920s, that doubles as a weathervane. In another corner stand a dozen carved walking sticks, dated 1830 to 1985. An alcove contains eight simple but powerful pieces from Kentucky wood-carver Edgar Tolson's "Fall of Man" series, a tour de force that depicts the Adam and Eve story. Nearby is a pen for nine animals, including a wooden pig, porcupine and squirrel. Not far away is a yellow wall decked with 30 carved duck decoys and, past that, a lake-blue wall hung with more than 75 fish decoys, each one gently curved to suggest a swim in progress. And that's just a sampling. Beautifully installed, in a mix of white and brightly colored spaces, "Uncommon Folk" is dazzling visually and startling in its breadth. 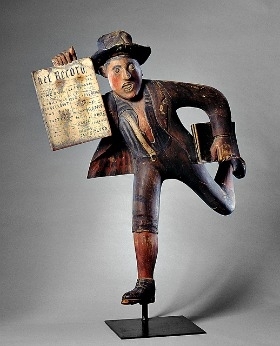 Almost every piece is drawn from the museum's pioneering collection of folk art, which dates to 1951, when few other art museums were actively acquiring it. Milwaukee's trove now numbers nearly 1,500 items and includes both traditional folk objects and so-called outsider art—or, as Margaret Andera, the curator of "Uncommon Folk," defines her terrain, art by people who were "influenced by their communities and cultural traditions rather than by art historical movements." Milwaukee has presented other folk-art shows, but this is the first time the museum has devoted so much space to this strength. Even so, Ms. Andera was compelled to winnow her themes to 16 (like history, religion, animals). She wanted the exhibit, whose objects date from the early 1800s to the 21st century, to be "consumable" but still show variations in style or method—"so that people can see a complete tradition, not just individual works of art." As folk art shines because of its freshness, vitality, honesty or innocence—not because it "progresses"—Ms. Andera has mixed up pieces from different periods, inviting viewers to compare and contrast. One corner of "Uncommon Views" presents landscapes and streetscapes dating from 1876 to 1988: It comfortably places a typical Grandma Moses village scene in springtime (c. 1950) near the detailed "Nathan's Coney Island" (1971) by Vestie Davis and naive "Landscape with House II" (1940) by Morris Hirschfield. At the center, by contrast, is a garish, more primitive, red, white and black "New England Landscape" by William L. Hawkins—painted in 1988, when Hawkins was 93. "Uncommon Portraits" offers groupings of couples, families, females and famous men (including Earnest Patton's undated, rough carving of Daniel Boone, Anderson Johnson's 1990 unpolished painting of Abraham Lincoln, and John Kane's striking portrait "Bust of a Highlander," c. 1925). A nearby wall is covered with a collage of penetrating self-portraits (mostly from 1995) by Ted Gordon, virtually every space filled with patterns rendered in ballpoint pen and marker. Frequently, these constellations have stars. It is hard to forget "Young Girl With a Cat" (c. 1955) [above left], who gazes out intensely and with a slight malice, by Drossos P. Skyllas. 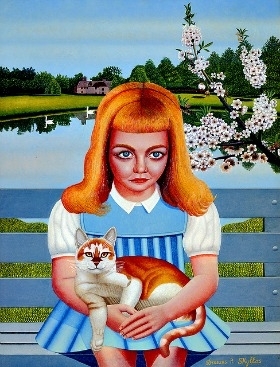 The work is a mix of the modern (the flowering tree, the confrontational cat) and the naive (the girl's hair, the swans reflected in a lake, the all-over light). Nearby is a counterpoint: the much simpler "Portrait of Elvira Ladd" (c. 1825, artist unknown), who, like the "Young Girl," wears a blue dress and stares at the viewer. In the religion section, in addition to the Tolson pieces, four 1988 biblical scenes by Oscar De Mejo, a children's-book illustrator, are especially memorable: Adam and Eve, in their nakedness, hide in bushes; rain pours down like a waterfall on Noah's Ark; a rainbow emerges to disperse black clouds; Joseph sleeps in his coat of many colors. Plainly colorful; plainly delightful. Several works made from discarded or natural objects are particularly engaging—snakes from tree roots; an undated staff of bottle caps, topped by a turbaned, bearded head, by Mr. Imagination(aka Gregory Warmack); and Quinton Stephenson's elaborate "Three Creatures Totem" (1994), made from cypress wood with horns, shells, glass eyes and pinecones, to name a few. The "tramp art"—a tradition involving the whittling and layering of wood into geometric, pyramidal designs—is also amazing, particularly a box, possibly for love letters, c. 1930, and a drop-front desk from 1897, which sits beneath a crown-of-thorns frame, a thick nest of sharp-edged wooden cross-hatches that looks just as it sounds. Ms. Andera chose three artists for special treatment: James Castle (1899–1977), whose highly detailed drawings were created with ink made from soot; Albert Zahn (1864–1953), "the birdman of Door County," whose carved birds, toys, angels and animals are whimsically wonderful, especially in bulk, as here; and Eugene Von Bruenchenhein (1910–1983), a separate case entirely. Von Bruenchenhein, who worked in a bakery and died in poverty, made thousands of works, often related to pop culture and current events. His colorful, fluid, almost abstract paintings allude to the cosmos and cities, for example, while his photographs—mainly of his wife—are glamour shots, often akin to pin-ups. Some of both were shown at last year's Venice Biennale, and they seem a tad out of place here. And yet, Von Bruenchenhein once wrote that his art came from "unknown forces at work . . . forces that have gone on since the beginning." The same might be said of all the artists represented here. Most weren't professionals, yet that creative urge imbued their works with a special something that turned them into art. Not everyone will agree that all of it is art, and there is room for disagreement. But "Uncommon Folk" provides evidence that much of it is, amply.